Chesterfield Town v Yeovil Town. 'Kristian Dennis celebrates after equalising in the second half. Chesterfield captain Robbie Weir hopes Kristian Dennis is still sat in the Proact dressing room when the transfer window closes. But Weir admits there are no certainties in football. 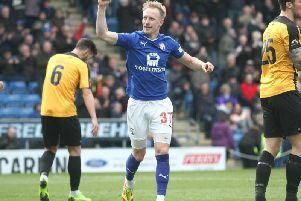 Dennis is the subject of interest from League One Bradford City, thanks to the 15 goals he’s scored this season for the Spireites. Weir isn’t surprised by the attention paid to the striker because he and the rest of Dennis’ team-mates value his contribution. “He’s scored some very important goals for us, he’s our top scorer,” said the Northern Irishman. “You never know in football, if he stays or goes, but I think all the lads in the dressing room would be pleased if he stayed because he scores a lot of goals for us. Under the management of Jack Lester, Dennis has scored nine goals in 21 outings. And Weir believes the frontman has got better in that time. “Since the gaffer came in he’s improved his game,” he added.